HERNDON, Virginia – The refreshed 2016 Volkswagen Passat midsize sedan is bound for Volkswagen dealerships later this year starting at $23,260, including an $820 destination charge. Pricing reflects a $1,100 increase over the base 2015 Passat, which is equipped with a five-speed manual transmission. 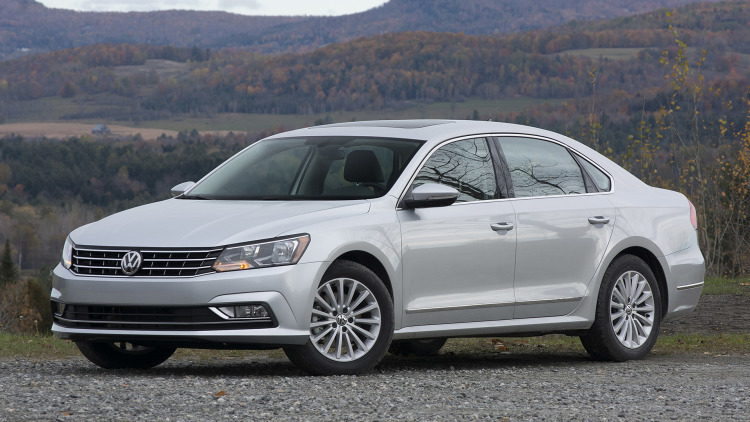 The new base price is for a 2016 Passat with a six-speed automatic transmission. The manual-transmission model has been deleted from the lineup for the new model year. Full pricing on the 2016 Passat will be available closer to launch, including pricing on the new R-Line version of the Passat, the automaker said on Monday. The Passat R-Line puts the emphasis on sportiness, with unique rocker panels, a stylized front bumper with contrasting black accents, a modified rear diffuser and 19-inch anthracite Salvador aluminum-alloy wheels. The new look for the Passat “features more aggressive styling,” VW said. Changes include a new hood, front fenders, grille, bumpers, trunk lid and optional LED headlights and taillights. This is the first time that LED exterior lights are available on a VW sedan. The upgrades are designed to make the Passat more competitive against the Ford Fusion, Honda Accord, Kia Optima and Mazda 6. The 2016 Passat also gets an upgraded cabin with a more premium look and feel. USB and Bluetooth connectivity are standard on all Passats. All Passats also have rearview cameras as standard equipment. New driver-assistance systems, including adaptive cruise control and autonomous emergency braking, are standard features on some trim levels. U.S. buyers have a choice of three powertrains: a 1.8-liter turbocharged and direct-injection gasoline four-cylinder engine; a 2.0-liter TDI diesel engine and a 3.6-liter VR6 six-cylinder engine. Optional VW Car-Net App-Connect supports smartphone integration with Apple CarPlay, Android Auto and MirrorLink. Edmunds says: VW improves the 2016 Passat sedan with an eye toward the wants and needs of American consumers, a move that should make it a more popular choice on lots of shopping lists.